Our liquid facelift doctors also aim to lessen you facial wrinkles and creases. Patients who don’t want to have surgical Blepharoplasty but want to remove their heavy eye bags and/or dark circles can also have this type of non-invasive face lift. The nice thing about the Liquid Face Lift is that it helps you bring back the natural contours of your face. With this non-surgical procedure, you get to bring back the suppleness of your skin and appear younger in as little as 1-2 hours time. A lot of people around the world have already tried this unique type of face lift procedure and nearly all of them can vouch for the amazing results they get from the Liquid Face Lift procedure. Not only do you get the chance to lift your face and feel young again, you can also improve the contours of your face heavily affected by the aging process and for much less then the price you would expect to pay back home. When you look young, you fell young. You will also feel much more energetic and confident about yourself. The benefits of liquid facelifts far exceed the low cost. Most people coming to Thailand for medical reasons already realize the high quality of medical care that exists in the Kingdom of Thailand. The prices for liquid facelifts here are 30%-45% less than the same procedure you would get back home. This procedure can last one to two years depending on the dermal fillers used and the depending on the specific area of the face treated. If you are looking for longer term results then our doctor may use of Juvederm or Dysport, as the results will last much longer with those dermal fillers. Nearly all healthy men and women qualify for the non-invasive liquid facelift. To know the exact cost for your Liquid Face Lift in Thailand, our doctors will need to understand your needs via some pictures and a short medical questionnaire. Our medical experts have extensive experience with non-surgical cosmetic surgery and can provide you detailed plan on what treatments are best for you based on your current age and skin condition. 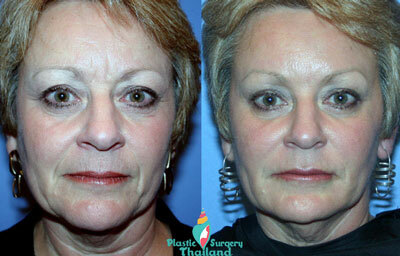 To learn more about the amazing new liquid facelift in Thailand, please contact us today.